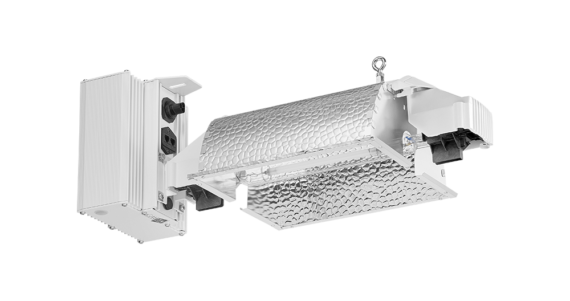 Ballast output is either controlled by the Gavita Master controllers, or an external switch, allowing it to be adjusted to 600, 750, 825, 1000 W, and 1150W boosted output. The Master Controller can centrally control the output hundreds of fixtures in a range between 500 and 1150W output power. Using the Master controller safeguards your valuable crop by the added auto-dim and auto-shutdown features, and completely automates your light control. The spread of the Pro 1000 equipped with the HR96 DE reflector is about 4×6 ft (110x180cm) at 3 ft distance in overlapping plans, providing light levels of up to 1000 µmol s-1 m-2. The reflector is replaceable (we recommend to do this every year to two years).